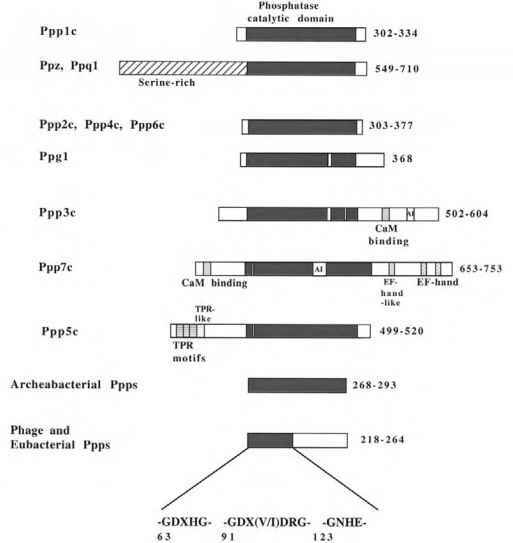 Figure 2 Domain organization of protein phosphatases in the PPP family. 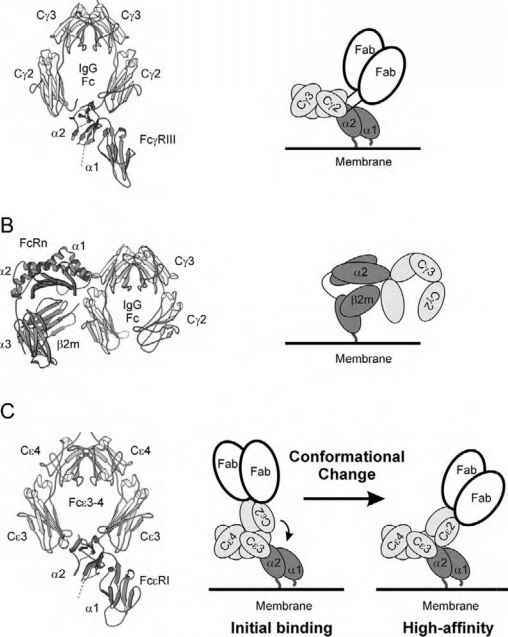 Bacteriophage and eubacteria Ppps show homology to the eukaryotic and archeabacterial protein phosphatases in the amino-terminal half of the catalytic domain, but the carboxy-terminal halves show little similarity. Autoinhibitory regions (AIs), Ca2+-binding EF hands, tetratricopeptide repeats (TPRs), and calmodulin (CaM) binding sites are indicated. The numbers of amino acids in different phosphatases with each type of structure are given on the right. The three invariant amino acid motifs found in all PPP family members are shown at the bottom of the figure (numbers refer to the amino acid position in PP1a1/PP1y1). of inhibitor-2, indicating that it is unlikely to be a property of the native enzyme in vivo . Ppp2 (PP2A) exhibits some protein tyrosine phosphatase activity in the presence of the protein PTPA . Bacterially expressed phage lambda Ppp exhibits protein-serine, -threonine, -histidine, and -tyrosine phosphatase activities , while native cyanobacterial PPP exhibits protein-serine, -tyrosine, -histidine, and -lysine phos-phatase activities in vitro . Thus, the activities of some Ppps may be wider than dephosphorylation of protein-bound phosphoserine and phosphothreonine residues. The discovery that the diadenosine tetraphosphatases have sequence similarities to the PPP family provides evidence that the essential PPP signature motifs for phosphomonoesterase activity have been utilized for the hydrolysis of biomolecules other than protein-bound phosphoesters . 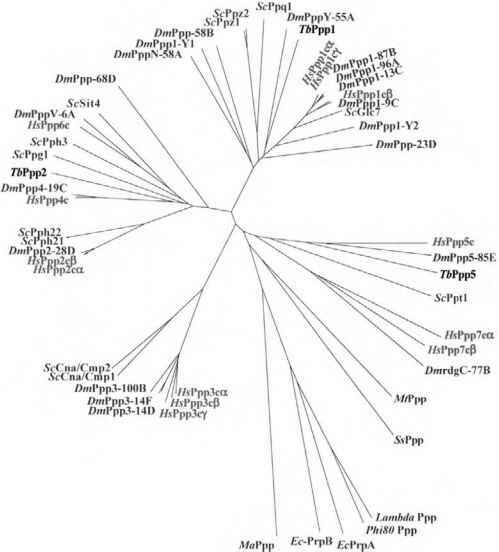 PPPs dephosphorylate serine and threonine residues that lie in unrelated amino acid sequences, suggesting that, in contrast to many protein kinases, specificity is not determined primarily by the linear sequence of amino acids of either side of the phosphorylated residue. Rather, these observations suggest that higher order structures and/or interaction with regulatory subunits are involved .